Once in people’s kitchens, these ingredients are carefully cooked following a wide variety of regional recipes. This results in delicious home made meals that taste like wisdom, love and tradition. Preparing, eating and sharing good food around a table is one of the pillars of Spanish culture. It brings people together and makes every day a celebration. During this Spanish food and wine workshop we will experience the joy of shopping, wine tasting, cooking and eating locally in the sweet little coastal town of Rota. Rota keeps a homely local atmosphere in its market where we’ll be able to find quality produce from the surrounding plots, farms and Atlantic waters. Your personal guide will help you understand the particularities of the famous local agriculture and traditional fishing techniques while together you buy the necessary ingredients for the day’s lunch. After shopping in the market, we will visit a local winery. There we will be introduced to the production and aging process of local wines before doing some tasting in order to choose your favorite variety. With all our shopping we will drive to a lovely house where we will take a master cooking class and have lunch. Our graceful local instructors, a mother and a daughter, are the best hostesses ever and live for cooking. They take a very active role in the local culinary scene and have been awarded prizes. They are filled with local knowledge and will be happy to share with us their best kept secrets. 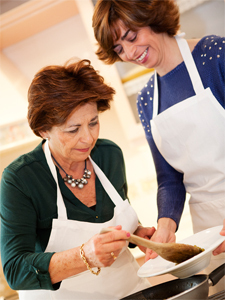 Together we will enjoy a great cooking lesson, delicious home made food and moreover bubbly conversation. After lunch, we will compile all the knowledge acquired throughout the day, say goodbye to our wonderful hostesses and then we will drive back to your accommodation. This day trip is ideal for people wishing to experience the wonderful local gastronomy of the bay of Cadiz. It includes private transportation in a modern and comfortable vehicle with A/C to and from your accommodation. Your personal guide and driver will pick you up in the morning and will drive you back in the late afternoon after spending a great day together enjoying the wonders of shopping, wine tasting, cooking and eating locally in Andalusia. Prices: start at 100 Euros per person (incl. VAT) for a group of 8 people. Includes: private guide and driver throughout the day, sherry tasting, cooking class and lunch with wine.